I make nature jewellery inspired by nature, wildlife and the plants and flowers that thrive in my wildlife garden. I’ve always been creative and have made crafts for as long as I can remember. I’m inspired by my great love of our great British wildlife and the outdoors – windswept beaches, wild flowers, gardening and the seashore. My nature inspired pieces are all handmade in solid silver and feature falling leaves, real leaf prints, flowers and natural gemstones. My designs also feature British wildlife including owls, foxes and hedgehogs. I love cats (I’ve got two rescue boys) and paw print and cat designs feature too! My jewellery is also a gift that gives back. Since 2012, I have been running a hedgehog hospital caring for sick and injured wild European hedgehogs. Hedgehogs are declining here in the UK at a rapid rate and there are thought to be less than a million left in the wild. My hospital is entirely self-funded (and it’s very expensive work!) and the jewellery helps to raise vital funds as well as combining my two passions of wildlife and making crafts. 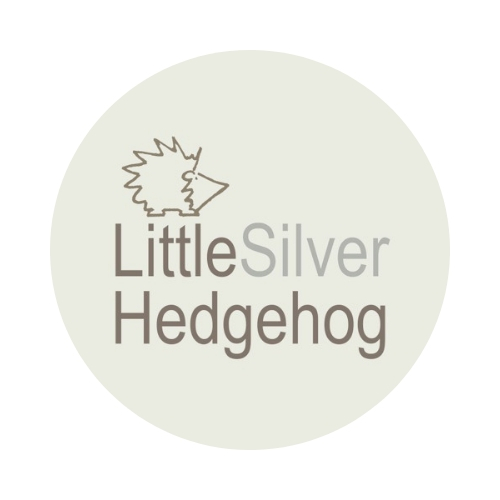 It also helps to spread the word about helping hedgehogs – the jewellery attracts much attention and is a great talking point. I hope you will think that my jewellery is beautiful on its own merits but that you will fall in love with the fact that it also helps my work to rescue hedgehogs. It really is a gift that gives back. I also love making bespoke designs so please get in touch if I can create something unique just for you. You can also support my hedgehog hospital in other ways too.